Our unique umbrella hats keep the sun off your head when it's sunny and the rain off your face when it's raining. Choose from a selection of assorted colors including combinations such as red and white or white and blue. Umbrella hats are great for picnics, outdoor concerts, sunny days or for singing in the rain! An inspiring invention which provides hands free protection from the sun and rain. Simply attaches to your head with a strap. 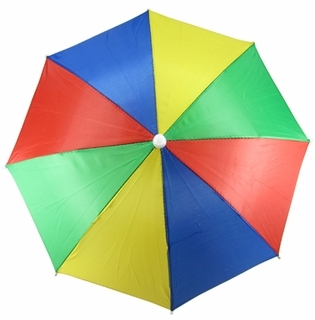 The umbrella cap is 21" in diameter and 12" length when closed. One size fits all.